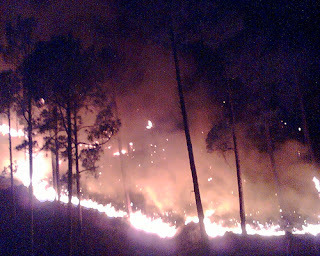 Wildfires have destroyed an area of forest stretching several kilometers along the Indo-Pakistani border in Kashmir. Crews have failed to extinguish the flames due to lack of appropriate tools and an insufficient number of personnel. "Fire is advancing on both sides of the border because we do not have suitable services and measures to control it," admitted an officer who spoke on condition of anonymity as he could be put on trial for disclosure of organizational flaws. People believe that the fires were sparked by lighted cigarette butts thrown down by residents fromthe nearby community. "Flames of the fire could be seen from a long distance and the temperature of the area has increased," said Riaz Hassan, a social worker, who visited the scene along with officials. "Explosions of minefields have also caused damage to green trees and wildlife," said Hassan. India and Pakistan have mapped minefields along the Line of Control in Kashmir, where heavy military presence and operations are causing ecological losses in addition to human causalities.Since the beginning of the tropical summer, sporadic wildfires have erupted on both sides of the Line of Control, which divides the disputed state in two - one part controlled by Pakistan and the other part controlled by India. A series of similar wildfire incidents, some described as arson, have destroyed a large forest area in Kashmir's southern region. "People living in areas adjacent to the forests intentionally carry out grassfires because they believe that it regenerates richer grass, which is used as food for livestock," says forest officer Rehman. In Pakistan administrated Kashmir, eighty eight per cent rural populations largely depend upon forest for livelihood. And eighty nine percent of households use wood for cooking and space heating. Contributing 0.3 percent to the country’s GNP, forests supply 32 percent of Pakistan’s total energy needs in the form of fuel wood. Jammu Kashmir, a forestry state divided between India and Pakistan, is habitat of Coniferous Forests, especially Deodar (Cedrus deodar) trees, which is acclaimed globally for its herbal and architectural characteristics. Sadly, habitat of such valuable eco-resources is in peril due to fires, timber smuggling, soil erosion and other reasons of deforestation. Government allocates modest resources for forest protection because politicians do not show any concern about alarming deforestation neither they have significant awareness of sustainable development and adaptation interventions in forestry and bio diversity. As a result, there is a plethora of lame excuses from government managers when they are questioned about the prevention of forest fires. “How can we overcome the problem of forests fire, when developed countries like the US cannot do so? Sardar Javed Ayub, forest minister was quoted in a credible Urdu Daily, seemingly defending his pitiable knowledge about environmental matters and pathetic performance of his subordinates. In the leadership of forest administers like him, it is obvious that little has been done by the government for the protection and preservation of natural habitats. Consequently, there is an acute shortage of required trained staff and modern fire fighting operational services. In this region a forest guard is assigned to safeguard 800-acre land, on the other hand, in Pakistan’s largest populated province of Punjab, 400 acres forestland is guarded by a single forest guard. Therefore, the depletion of forests is happening with an alarming rate. According to government estimates about 0.8 million acres of forest and range lands are affected by forest fires causing about 15,000 cubic meter timber loss annually. Jammu and Kashmir forests are vital in protecting the catchment areas of water reservoirs used for power generation and irrigation for both India and Pakistan which hold political and administrative control of the region. Kashmir is origin of major Indian and Pakistani rivers. Pakistani has been declared as second biggest country with respect to deforestation. FAO says with only 0.05 ha of forest per capita against a world average of 1.0 ha, Pakistan is comparatively forest-poor. In such gloomy context, environmentalists are concerned over the depletion of ecological resources and biodiversity loss. “It is not merely a matter of diminution of forest due to the wildfires which alarm us. Indeed, fires are the major intruder to the fragile ecosystem,” Ejaz Ur Rehman an environmentalist, explains the implications of reduction of natural habitat.